If you’re looking for a rental that is as open and airy as it is luxurious, Lune Villa is it. This is a 3-bedroom house that can accommodate up to eight guests, and children are welcome. It sits on a hill at Trunk Bay, so the views are elevated and seem to have that extra sparkle that visitors look for. The beautiful combo of Tortola’s green landscape and the turquoise water are available from practically anywhere in the house, especially the outdoor dining terrace (which features an awesome table), the lounging deck, and the pool. The living room has large glass sliding doors that give you the option of enjoying the ocean sounds from inside. Plus the kitchen provides windows that can open up, and all of the bedrooms have ocean-facing balconies. And even with the villa’s flexibility on barriers, it is completely air-conditioned. Walk to Trunk Bay Beach in only ten minutes, or you can explore what else Tortola has to offer with a car rental. 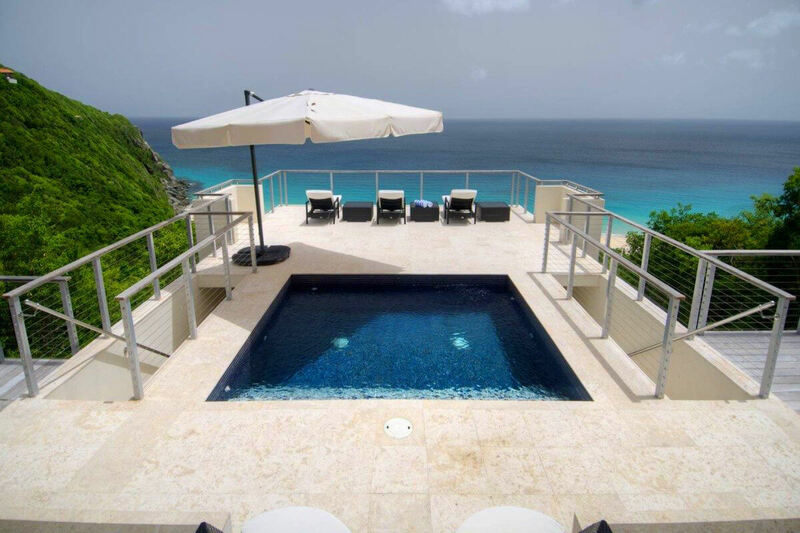 Lune Villa is a stylish, contemporary house with a distinctly Mediterranean feel, situated on a quiet hillside above Trunk Bay, Tortola. You are greeted at the entrance to the property by large blue urns of tropical flowers and a unique water feature that flows from a fountain down through the middle of the mosaic outdoor dining table. The pool and surrounding terraces provide the focal point of this stunning vacation home. The sun terrace beyond the pool is furnished with comfortable loungers that offer an unobstructed view of the turquoise water, white sand beach, and lush tropical hillside. The beach is so close that you can actually hear the gentle lapping of the waves. Outdoor living is the recurrent theme at Lune Villa. The kitchen has large windows that open out to the dining terrace so that you are never far from the party, even while cooking. The contemporary style and design throughout the house is evident from the comfortable furniture on all decks and terraces to the high-end appliances in the kitchen. The bedrooms have been carefully situated to offer privacy from the rest of the house, each with a private sea-facing deck, and air-conditioning and en-suite bathroom are, of course, standard. The beach at Trunk Bay can be reached on foot within 10 minutes, but we recommend that you rent a car to explore the many other beaches and activities that Tortola has to offer. Perfect for a group of couples or for families, Lune Villa offers island living at its very best.